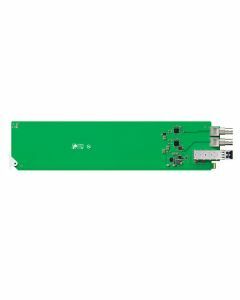 OpenGear Converter Independent bi-directional SDI to optical fiber and optical fiber to SDI. SDI Video Output: Automatically matches the SD, HD and 3 Gb/s SDI Input. Optical Fiber Video Input: 1 x 10-bit SD/HD/3 Gb/s SDI switchable. Optical Fiber Video Output: 1 x 10-bit SD/HD/3 Gb/s SDI switchable. SDI Compliance: SMPTE 292M, SMPTE 259M, SMPTE 296M, ITU-R BT.656, ITU-R BT.601 and SMPTE 297M for Optical Fiber SDI.